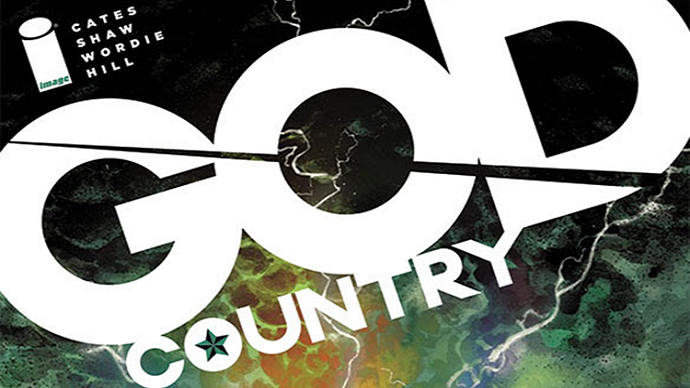 God Country is a six-issue limited series that’s been described as “Southern Bastards meets American Gods.” With its gritty themes and Texas backdrop that draws heavy influence from Cormac McCarthy novels, the comic is then fused with a surrealist fantasy storyline midway through the first issue. Given that I love all things McCarthy, Jason Aaron and Neil Gaiman, this book perfectly combines two of my favorite genres of fiction. The story follows Emmett Quinlan, an elderly man and a widower from Texas who suffers from dementia. As his condition worsens to the point of him becoming uncontrollably violent with others, it puts a strain on his son and his family. Despite his son’s determination to take care of his father and keep him away from a nursing home, the situation is becoming too much for him to handle. Yet just when things appear hopeless, Emmett discovers a magical sword which restores his mind and spirit, so long as he’s holding it. With this weapon, he’s able to remember who he is and who his family and friends are, and is determined to keep it. The only problem is that the armored god who the sword belongs to wants it back, and is willing to fight Emmett for it. 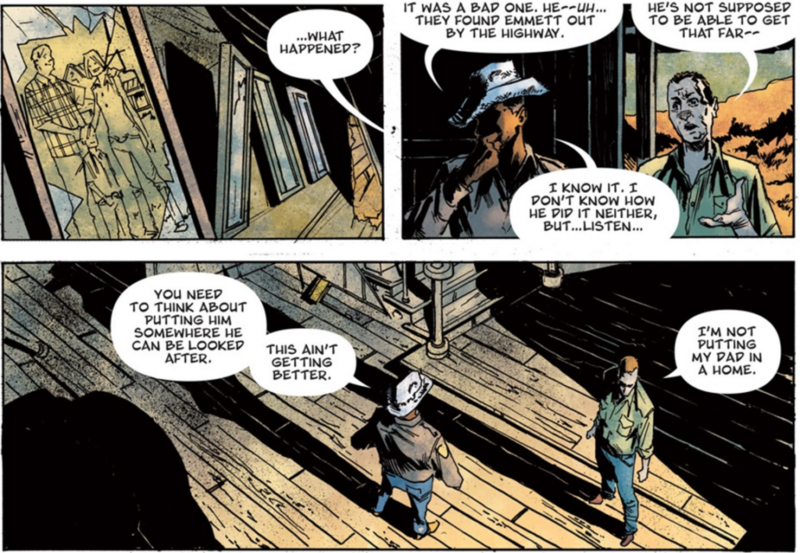 The magic of God Country is apparent in everything from the high-concept premise to the characterization to the gorgeous illustrations by Geoff Shaw. In the opening pages the book is all gritty western drama, replete with a quote from McCarthy’s Blood Meridian at the beginning. Then after the initial exposition, Emmett receives the sword during a bombastic storm sequence that’s strikingly reminiscent of American Gods. Writer Donny Cates does an especially good job of merging these two different genres together, making for a story that gets weirder, wilder and more emotionally gripping as it progresses. Amidst all of the high-octane action and mythological elements, what really drives the story is Emmett’s relationship with his family, and his desire to be himself again. Over the course of the book he battles his deity opponent, ventures into Hell to save his granddaughter and puts his loved ones at risk as he gets caught in a war with the gods. Yet as all of this is going on, the emphasis is more upon his spiritual journey and longing to find himself. Cates does explore the world of the gods, which is mostly rooted in Greek and Roman mythology, but he never makes it the main focus of the narrative. This is a story about a man who’s lost everything trying to reclaim his soul, his life and his family. In terms of the art, Shaw utilizes a grim, subdued color palette, and a nice blend of realism and surrealism. I’m not saying this just because I love this comic, but Shaw’s work is well worthy of comparison to greats like Steve Dillon and Jason Latour. It’s powerful, cinematic and a splash page of the sword-bearing god hovering over Earth in issue one will leave readers drooling. With how good this creative team is here, I’ll definitely be checking out their new Thanos title for Marvel this fall. God Country is just one of those titles you have to experience for yourself. I was able to get the trade paperback with an exclusive variant cover from my local comic shop, but the regular cover is just as good. Get it today, and be sure to keep an eye out for Cates and Shaw to see what they do next. Tags: Comics, God Country, Reviews. Bookmark the permalink.